Sandakphu Phalut trek or the shorter Sandakphu trek is a must do trek for people looking to explore Darjeeling/Sikkim hills with breathtaking panorama of Himalayan peaks. Sandakphu is the highest point of West Bengal at 3636 m/11926 ft in the district of Darjeeling and Phalut is another table top on the same ridge. This trek follows the famous Singalila Ridge, a prominent spur of high ground that lies at the southern end of a long crest, which runs down from the Kanchendzongha massif and forms the border between Sikkim & Nepal. One of the unavoidable necessities of trekking in Himalaya is that the best views are had from high up but the trek along this ridge, passing through small settlements, is perhaps the one of the most scenically rewarding in the Himalaya. This is indeed an ideal trek for the experienced trekkers in a Tea-House style. There are spectacular panoramic views of Nepal Himalayas including Kanchendzongha range, Makalu, Everest, Lhotse, Janu, Chamlang, Baruntse and a host of Sikkim peaks all seen in one stretch. The famous “Sleeping Buddha” formation of peaks is a delight for all. The Singalila National park area has rare species like Red Panda and is a birder’s paradise. Flowering of Rhododendrons and Magnolia turn the forest with red, pink and white shades during spring and foliage hue during fall. Note: Book your return ticket not before 8 pm from NJP/Bagdogra on Day 7. This is a “Tea House” trek, i.e we don’t camp inside Singalila National Park but stay in Homestay/Lodge available on the trail. As you should expect on a mountain trail, these are basic accommodation run by the local Nepali/Tibetan families. Rooms are dormitory bed type with triple/quad sharing or more. Beds and blankets are neat and clean. Don’t expect an attached toilet or running hot water anywhere. Do we tent/camp during Sandakphu Phalut trek? No we don’t. As a matter of fact, none is supposed to camp within the boundary of Singalila National park. 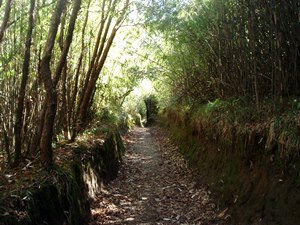 This trail inside national park is designed for years to run a Tea House mode trek, same as its neighbouring Nepal treks. If you prefer a pristine full camping trek, we do have more legitimate options for you. These treks lie further north to Phalut on the Singalila ridge inside Sikkim and offer closer views of Sleeping Buddha and high mountains of Nepal and Sikkim. Our less crowded Phoktey Dara or Singalila Pass Phalut trek will surely entice you for great camping experiences. Phalut has only one Govt. operated GTA Trekkers Hut for accommodation with ONLY 16 beds. This can’t be booked online neither availability but to check physically at their office (http://www.gtatourism.com/reaching_governmentaccomodation.html). There is NO private accommodation/lodge at Phalut or vicinity. Due to heavy demand mostly this is full in the season. Also it has been observed that beginners/first time trekkers are often finding it difficult to cover the 21 Km trail from Sandakphu to Phalut. So considering both we either keep you at Phalut Trekkers Hut or at Sabarkum/Molley, a place 14 Km from Sandakphu on the way to Phalut. This is decided case to case as per each individual group. However the itinerary remains same and you reach Gorkhey via Phalut in case the accommodation is at Sabarkum/Molley. Though the trail ahead of Sandakphu is Easy considering the terrain, but adding Phalut involves total 6 days of trek covering around 80 Km. Often it can be strenuous if not prepared well. Also beginners as well as experienced trekkers can find it exhausting to reach Phalut, 21 Km from Sandakphu in a day. However we have started arranging a smaller version of this trail omitting Phalut from the itinerary. 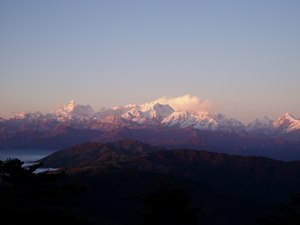 This is the shortened version of Singalila ridge trek and called “Sandakphu Trek”. 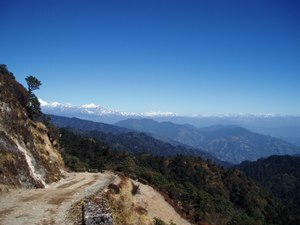 The wonderful walk along the ridge is ideal for the beginners/first timers, who want to explore Darjeeling/Sikkim Himalayas. This essentially retains almost all the flavour that the Sandakphu and Phalut produces, certainly the not scenic walk to Phalut! However this is not a showstopper considering the trail is same (initial 3 days of trek) till Sandakphu. Sleeping Buddha, Famous trio (Everest Lhotse, Makalu), and numerous Sikkim and Nepal high Himalayan ranges can be observed. 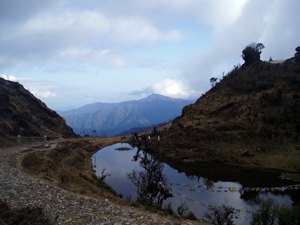 The descent from Sandakphu to the beautiful village of Gurdum is similar in beauty that of Phalut to Gorkhey trail. 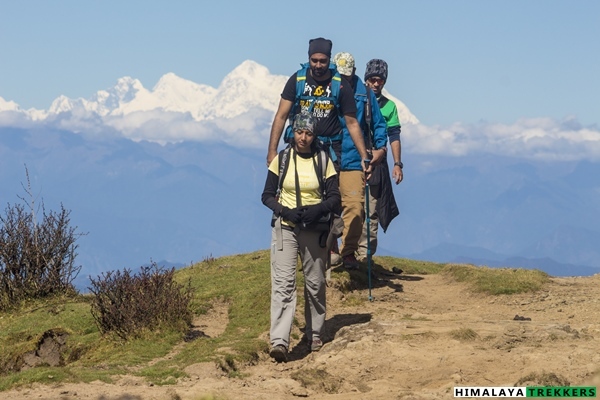 Finally the Sandakphu trek also ends at Srikhola same as the longer duration Phalut trail. 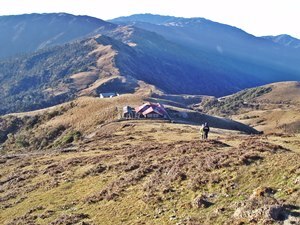 Advantage of Sandakphu trek is this trail requires 4 days of trekking and can be done year long apart from the monsoon (June to September). 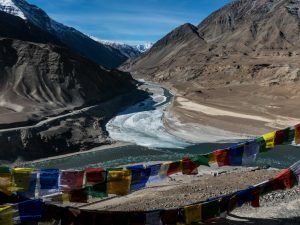 The walk is not strenuous like Phalut and covers around 40 Km in 4 days which is indeed an Easy grade trek and can be completed comfortably by anyone who has got basic physical fitness and will to walk. We strongly advice to check our “Sandakphu Trek” itinerary, who want a shorter and easier version of this trail without losing much. We will arrange a pickup from NJP/Bagdogra/Siliguri to Chitrey and drop from Srikhola to NJP/Bagdogra. This will be shared by the team members on actual basis and paid directly to the driver. Typically a Tata Sumo/Mahindra Maxx type Jeep charges Rs 3500 for a drop to Chitrey and Rs 5000 from Srikhola to NJP/Bagdogra. One such car can accommodate 6 to 8 people. This cost is NOT included in the TREK FEE. To reach the trek base Chitrey the access in from NJP/Siliguri/Bagdogra. For details on how to reach nearest railways station/airport and move to trek base independently/public transportation check the details in GETTING THERE TAB. Duration: 6 days of trek; NJP/Bagdogra to NJP return in 7 days. Prerequisite: Prior Himalayan trekking experience is highly advised. There are long and strenuous days in the trek. 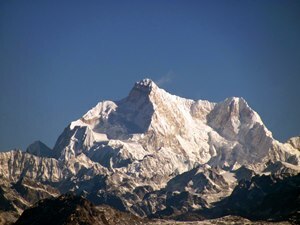 Further Option: From Phalut continue along Singalila ridge in West Sikkim and descent to Barshey or Uttarey. Access: Trek starting point is Chitrey (Maneybhanjung) and end point is Srikhola. 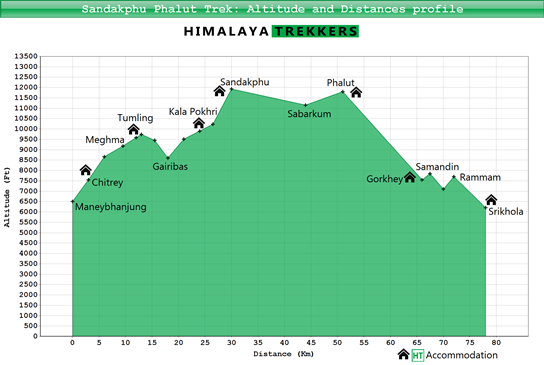 Trekkers need to reach NJP on Day 1 morning or the previous night. Return to NJP on Day 8 afternoon or early evening. Arrange your tickets for inward journey and return accordingly. We will arrange a pickup from NJP/Bagdogra/Siliguri to Chitrey and drop from Srikhola to NJP/Bagdogra. This will be shared by the team members on actual basis and paid directly to the driver. Typically a Tata Sumo/Mahindra Maxx charges Rs 3500 for a drop to Chitrey and Rs 5000 from Srikhola to NJP/Bagdogra. One such car can accommodate 6 to 8 people. This is NOT included in the TREK FEE and to be payable directly to the driver/owner. Reaching Chitrey without a reserved vehicle will require some local road knowledge and changing of vehicles. Return from Srikhola is much easier as there are direct shared service to Siliguri and Darjeeling. From NJP railway station take a shared jeep for Darjeeling and get down at Ghoom railway station. You can get one such shared jeep from Tenzing Norgay Bus terminus/Junction area in Siliguri also. From Ghoom take one shared service for Sukhiapokhri which is 12 Km. Change from here to Maneybhanjang, 7 Km away. Our trek base Chitrey is 3 Km up on the Sandakphu road. You are supposed to reach our Homestay at Chitrey on your own. You may get one vehicle to hire from Maneybhanjang to Chitrey (for Rs 400/500) but that depends on time and on driver’s will. From NJP/Bagdogra reach Darjeeling Mor (crossing/chowk in Siliguri on the way to Darjeeling) on Hill Cart Road. From here you get shared services for Sukhiapokhri. From Sukhia you can reach Chitrey as mentioned earlier. Be sure that you have enough time as you may have to wait long for your turn. Sometime you may get a direct Maneybhanjung service (essentially the cars returning to Srikhola) in around noon/early afternoon. While returning things are much easier. There are morning shared services from Srikhola to Siliguri and Darjeeling. For Srikhola there are two vehicles early in the morning at 5:30 am to SIliguri. It takes 6/7 hours to reach Darjeeling Mor in Siliguri (Rs 400 per seat). From here take an auto rickshaw to NJP/Bagdogra. From Srikhola you get shared services for Darjeeling city. Early morning vehicles start between 6 and 7 am. Then you get jeeps between 10 and 11 am. It takes around 4 hours to Darjeeling (Rs 200 per seat). Trekkers reaching on the previous day before the journey to the actual trek base need to stay the night in Siliguri/NJP. There are several options in Siliguri for spending a night while staying in Standard or Budget accommodation. It is better to reach to the centre of SIliguri called Siliguri Junction (adjacent to Tenzing Norgay Bus Terminus and Sikkim nationalised Transport/S.N.T stand). It takes 30 minutes from Bagdogra or 15 minutes from NJP. There are hotels 5 minutes walking from NJP also. Normally you reach NJP/Bagdogra from any trek base by 5/6 pm in the evening. You can take any train after 7 pm to Kolkata safely, which reach early in the morning. Accordingly arrange your homeward journey from Kolkata onward. Pick up from NJP railway station in the morning by 10 am and drive to Maneybhanjang (~ 1980m, 6500ft). Distance around 110 km and takes 6 hours. The road goes through the foothills of Eastern Himalaya (also called Dooars) and gradually gains the height. 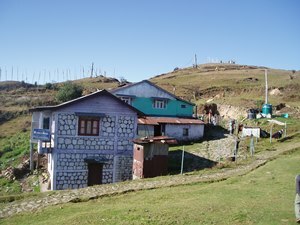 There are two roads of which one goes through the hill town of Mirik and the other via Ghoom. The last 3 Km from Maneybhanjung to Chitrey is a steep road with several hairpin bends and eventually reaches the hilltop clearing at Chitrey (~ 2300 m, 7550 ft). Chitrey is a small hamlet with of handful houses and a solitary lodge. There is a colourful monastery and Buddhist Stupa beside. Walk up to the top of the hillock for sunset and a distant view of the hill queen Darjeeling city. All the major mobile networks work here. Night stay in lodge. Our trek starts today. There is a motor able road to Sandakphu from Maneybhanjung and the distance is 33 Km. This is not at all advisable as the height gain is abrupt. 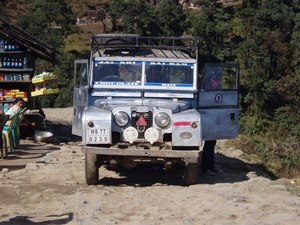 Only few 1930’s made Land rovers ply between Maneybhunjung and Sandakphu on the bumpy road. These wonder cars ferry local villagers with loads of provision. Our trekking trail often crisscross with the road. We start walking and after few turns on the table top meadow reach the tea stall at Lamey Dhura (2640 m/8660 ft) in an hour. Now the trail can be seen clearly till Meghma and while we gradually gain height. As the route often defines the border between India and Nepal ad thus posting of Paramilitary camps of SSB (Sashastra Seema Bal) at all the major points are common. From Meghma (2800 m/9180 ft) the the road splits and we take the left one. The one in the right leads to the top of Tonglu and then by descending eventually joins at Tumling. After traversing for an hour and half we reach the destination Tumling (~ 2920 m, 9580 ft). Total distance is 9 Km and can take 5 hours. We stay for the night in tourist lodge. Wake up early in the morning to view the sunrise. High Himalayan peaks look magnificent in the golden hue. We start our walk on a level ground and reach the Check post of Singalila National Park in 45 minutes. From here we obtain the permit and entry ticket for the national park. Just after the check post the road bifurcates. We leave the jeep road and take the left trail into Nepal. The terrain is wide spread and walking on the rolling trail we reach the Nepalese village of Jaubari (2880 m/9450 ft). From the village the main road leads to the eastern Nepal town of Ilam and we take a right turn and descend on the stony trail. The trail far ahead is clearly visible from here and after an hour we descend to the Indian settlement called Gairibas (2600 m/8600 ft). 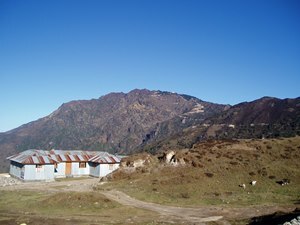 There is a Trekkers Hut, SSB camp and a shop which serves tea and noodles. From this point our climb for the day starts. The road enters into the dense forest and we take shorts cuts often which meet the jeep road while gaining altitude in short distance. A moderate climb of one and half hour leads us to a valley and a small settlement called Kaiyakata (2900 m/9510 ft). There is a tea stall at the left hand side of the road. From here the road turns to a semicircular arc and splits. We take the left one which gradually enters into the thick forest of conifer, birch. and Rhododendron. After walking an hour a small pond is seen on our left. 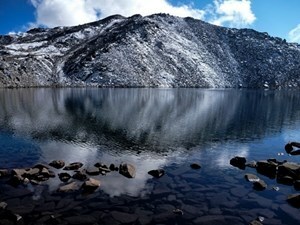 This is called Kalapokhri ( Kala is Black and Pokhri is a lake in Nepali). From here we take a right turn and reach our destination for the day Kalapokhri (~ 3020 m/9900 ft). There are ample lodges beside the main road strip inside Nepal and we stay in a lodge here. Total distance is 12 Km and may take 6 hour. Today we need to cover a short distance but gaining altitude. 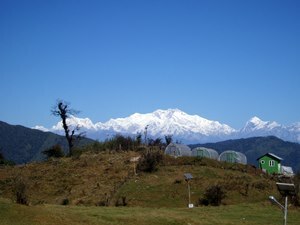 The lodges on top of Sandakphu can be seen from Kalapokhri. We traverse the mountain ridge to reach Bhikey Bhanjang (3120 m/10230 ft) in less than an hour. This portion of the trail is inside Nepal and Indian road joins here from the other side of the mountain. There is a tea stall on our left and a forest check post on the right. The road splits and the newly built road inside Nepal takes a longer path on our left to reach Sandakphu. We take the straight road ahead and start climbing. The switchback road has several turns and we go off road in few occasions. On the right hand we can see one ridge after another meeting the horizon. Silver fir and Pine tree dominate the treeline. After ascending for an hour and half we turn left and reach the top of the ridge Sandakphu. The left side of the ridge is in Nepal and the right side in India. On both sides of road there are lodges and tourist huts. The top of the ridge is somewhat flat and the north side is open. On the right side of the motor road a small hump on the left is Sandakphu top (3636 m/11926 ft) marked with cairns and prayer flags. There is no ridge higher than this point and so the view of the mountains are uninterrupted. Total distance we cover is 6 Km and can take 3/4 hours. Infrequent mobile signal is available. We stay at the lodge on the Nepal side of the ridge. Wake up before sunrise for remarkable view of the Himalayas. The wide panorama of Nepal, Sikkim and Bhutan ranges about 320 Km long is visible from left to right. Snowy mass of mountains looking like a gigantic wall mesmerise. Towering Kanchendzongha is straight ahead and marks the border between Sikkim and Nepal, along with Kabru, Pandim and Janu (Kumbhakarna) dominates the scene. 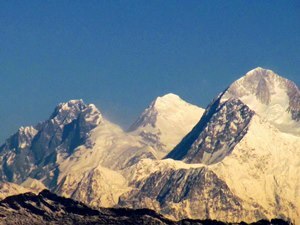 To the left of these peaks and in the west graceful and majestic Everest stands tall in a distance along with Lhotse, Baruntse and Chamlang. Today’s walk surely makes entry in the list of finest ones in the Himalayas. 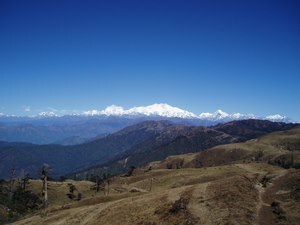 The main trail from Sandakphu goes to the left towards Phalut and a secondary trail on the right descends to Rmbik via Gurdum and Srikhola. The 21 Km long trail runs along the ridge line while high mountains to the north and northwest. Terrain relatively flattens with receding treeline. The trail gradually descends to Sabarkum (~ 3350m, 11000ft), 14 Km away. A lone tea stall welcomes you here with noodles and biscuits. From here the trail splits, straight one descends to Rimbick via Molley. We take the left trail which gradually ascends to Phalut (~3600m, 11800ft). There are only two options to stay here, the Trekkers Hut can comfortably accommodate 20 people and the Forest Hut with two rooms. Phalut is a table top mountain without any trees but rolling meadows all around and notoriously windy. Fierce wind swirls around the trekkers hut in the night. To cover a distance of 21 Km it takes around 8 to 10 hours. 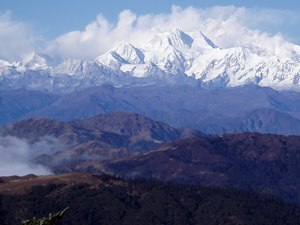 Most of the people only visit Sandakphu and descend directly to Rimbik via Gurdum and Srikhola, bypassing Phalut. There is an old argument about which is better, Sandakphu or Phalut? In a different approach, the reward for visiting Phalut is threefold, (a) The spectacular walk from Sandakphu to Phalut (b) being situated further northeast, Phalut is aerially closer to the mountain ranges (c) descending trail from Phalut leads to the picturesque villages of Gorkhey and Samandin. There is small table top in front of Trekkers Hut which shields the view. We wake up before sunrise and climb to the top for 20 minutes. In the morning it can be cold and windy. Use windproof, gloves and balaclava. The views are simply breathtaking while the entire range is much closer. The shape of the Sleeping Buddha formation is surprisingly beautiful, Jannu (Kumbhakarna) forming the head, Kanchendzongha the body and Pandim forms the toe. Everest group of peaks are a bonus! . After breakfast at Trekkers Hut we take the trail on the right from here and after a kilometre we cross the SSB camp of Phalut on our right. Taking a turn on our right we start the moderate descend. The main trail takes a longer path revolving on the face of the mountain while the shortcut is steep cutting the main trail at perpendicular at intervals. The vegetation is thick with bamboo cane forest making a canopy at times. As we go down, tress become larger and denser. Moss laden trees, different varieties of Rhododendron, Silver fir, pine, spruce, chestnut, oak, giant magnolia and hemlock are abundant, teeming with bird life. Look out for the board and arrow showing the direction for the village Gorkhey. From this point we leave the traversing trail and descent to the village. It will take around 5 hours to cover the 15 Km descent. This is picturesque small village named Gorkhey (average elevation ~ 2400 m/7900) beside a stream (named after the village, Gorkhey Khola) marking border with the southern part of West Sikkim. 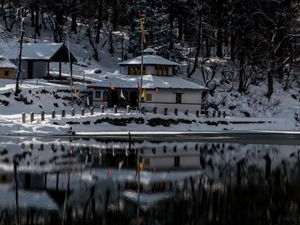 Private lodges and a Trekkers Hut are available for stay. We start the day by climbing a small hill to reach another village called Samandin. A picture perfect village on the table top, a school for the kids, farming fields, and fenced with the tree. We keep moving along the trail which runs inside the village and enters into a pine forest. Gradually descending through the forest for an hour we reach a small side stream. From here we climb a ridge to enter the next village Rammam. Kids playing on the ground beside the school welcome the visitors. 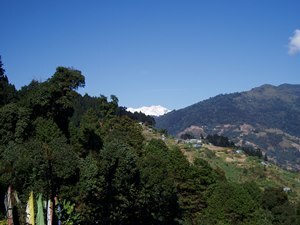 From here we can see a vast open valley and numerous scattered villages on the mountains of the Sikkim side. We walk on the level ground to cross the village and reach a point where the trail splits. Take the left one which is cobbled with rocks and steadily descend for another hour to reach our destination for the day Srikhola (~ 1900m, 6200ft). Total distance is 15 Km and can take 5/6 hour. Here both the trails from Sandakphu and Phalut meet. 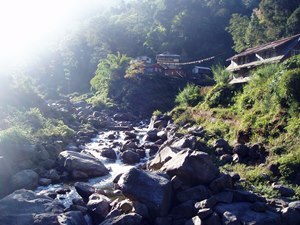 The private lodges and Trekkers Hut are placed in a narrow valley beside the river. A cable suspension bridge connects it to the road which leads to Rimbik. Now the motor able road has been built till the other side of the river. Have your lunch here (depending upon the time) or move forward for your next destination. Drive back to NJP/Bagdogra via Rimbick and Maneybhanjung in 6/7 hours. 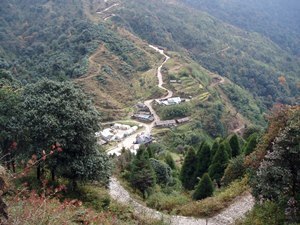 If you have more time for holiday tours to Darjeeling/Gangtok etc. you may reach Darjeeling town in 4 hours from Srikhola and is 90 Km away. 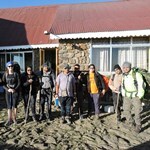 The above TREK FEE is per person charge for a small group of 4/5 trekkers. We are unable to arrange Phalut trek for larger groups currently. attached toilet or running water inside. All meals during the trek. Regular Indian style nutritious vegetarian food during the trek (including occasional eggs), breakfast, hot lunch (en route), snacks, dinner along with coffee/tea/soup. Permit Fee for Singalila National Park. Accidental Insurance Policy covering high altitude trekking tours (For Indian nationals it is included in the TREK FEE, up to 60 years of age). 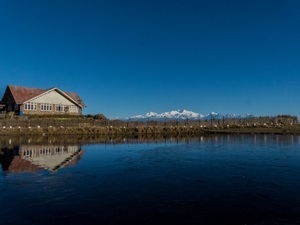 It covers your trek as well as your return journey to NJP/Bagdogra as per itinerary. Basic First Aid and Medicine kit. Transportation from NJP/Bagdogra to Chitrey and back (₹ 3500 for NJP to Chitrey and ₹ 5500 from Srikhola to NJP/Bagdogra and ₹ 3500 for a drop to Darjeeling by a Tata Sumo. We assume that you will carry your personal Rucksack/Backpack with all your personal belongings. If you want to offload your Rucksack/Backpack and carried by a personal porter then you need to spend additional charges. Charges are fixed as per Maneybhanjung Guide and Porter Association as ₹ 1000/day (wage) & ₹ 200/day (subsidised food expenses) i.e. ₹ 1200/day. A porter can carry up to maximum of 17-18 Kg ( 2 rucksacks). Alternatively we can arrange horse which is approximately ₹ 1200/day but can comfortably carry 4 rucksacks. You pay directly to the porter/horse owner. Still/Video camera charges inside the Singalila National Park. We assume that you have read and understood our “Terms & Conditions” before Booking a trek/tour. 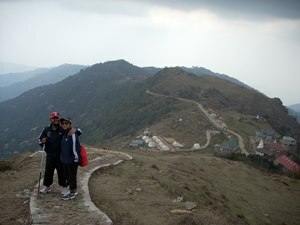 My first trek was Sandakphu & Phalut with HT. Everything was mesmerizing. Thanks HT for giving a wonderful experience.